This page contains a translation into English of the lyrics to the popular Arabic song "La Titnahad", which was sung by Kazem El-Saher. His name is also sometimes spelled as Kadim al-Sahir or Kazem Al Shaher. Also included is a transliteration of the Arabic lyrics into the Roman alphabet so you can sing along if you like. 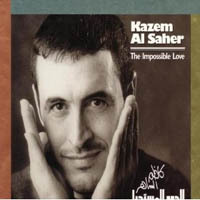 Kazem el Saher has often been compared to legendary Egyptian singer Abdel Halim Hafez because of his emotive singing style. Like Hafez, he has also been a heartthrob in the eyes of many young Arab women. A native of Iraq, el Saher was trained in Baghdad's prestigious Music Academy. He began his career as a songwriter creating music for other Iraqi singers, but eventually moved on to become a recording artist in his own right. He relocated to Cairo, Egypt, and built a following as the voice of Iraqi exiles. Al-Saher has been at the forefront of a return to romantic classicism in Arabic music, steering clear of the pop sound that is so prevalent today. El-Saher is known for his perfectionism and attention to detail, and praised for his non-traditional use of long-forgotten maqamat (musical building blocks) in his compositions. Laaa, la titnahad. No, don't you sigh. Wel nar elli if sadrak tibraad. And the fire in your chest will cool. Laaa, la titnahad. No, no, don't you sigh. La wallah. Oh, I swear by god. Ma a'andi ihdood li ihsaasi. There are no limits to my feelings. Ana a'ashek min kadami le raasi. I'm in love from my heels to my head. Ana kol lahza maa'ak atjaddad. In every moment with you, I'm renewed. La titnahad. Don't you sigh ... No. La, la la, la titnahad. No, no, no, no don't you sigh. Azkor leiyla ma ghazaltak. I recall a night I confessed my love. La we ia'younak ma tetasad. But I never meant for that. Iw-la, la, la titnahad. And no, no, don't you sigh. La, la titnahad. No, don't you sigh. La, la, la, la, la titnahad. No, no, no, don't you sigh. La, la, la titnahad. No, no, no don't you sigh. La, la, la, la titnahad. No, no, no don't you sigh. La, la, la, la titnahad. And no, no, don't you sigh. La, la, la, la titnahad. No, no, no, don't you sigh.